A friend asked me why I started a Blog page, and more specifically why I search blogs. I started looking at other artists blog pages because I wanted to see what people were doing, I also find them very inspiring and when my mojo is low....they get me up and moving. My daughter got me going on my own blog page. I did this mostly to be able to display the projects I've created and reach out to other bloggers through Sketch Challenges. I must say I wasn't prepared for what happened when I started following blogs. The first blog I followed is http://simplysouthernsandee.blogspot.com/ She has always been very encouraging and gave me "The Beautiful Blog" Award. What a boost to my ego that was. While checking out more blogs and I found out about Sketch Challenges. What better way to keep making cards. 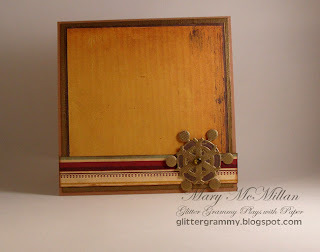 The card in this blog is from Mojo Monday Week 106 - want to play along? Here's the link: http://mojomonday.blogspot.com/ Another sketch challenge that I just found is: http://www.kgiron.blogspot.com/ I entered a card this week. Through blogs, I can travel the world and never leave my studio. I've met great people, I've seen thousands of beautiful cards and scrapbook pages and I'm constantly inspired to try something new, to get out of my comfort zone and create. My daughter said she is so surprised that I never seem to tire of card making. Well now you know why.....Blogs keep me moving. So....what did I use to create this card? Spellbinder dies. 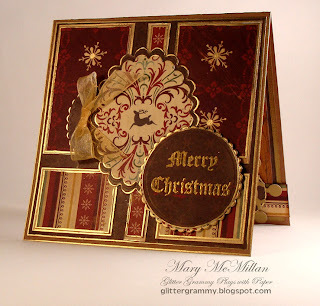 Cosmo Cricket - More Jolly by Golly card stock and an older Stampin Up rubber stamp. I also used a Krylon gold leaf pen. The ribbon is from my stash. Happy Blogging...Happy Wednesday and Happy Creating. Beautiful card with rich colors! Great job! I love this card and the colours are just so fabulous. Oh Mary! You are so sweet! Isn't this blogging and making friends with people from all around the US and the world fun? Now this Christmas card is GORGEOUS!!!! I love how rich and elegant it is! You are so talented! Hope you have a great weekend!